A musical drama and romance, My Fair Lady is a lavish, joyful story filled with social satire and wondrous songs. London, in the early 1900s. Phonetics Professor Henry Higgins (Rex Harrison), a conceited confirmed bachelor, stumbles upon young Cockney flower seller Eliza Doolittle (Audrey Hepburn). A strong believer that language skills determine status, Higgins accepts a challenge from his colleague Colonel Pickering (Wilfrid Hyde-White) that he can transform Eliza into a classy society woman within six months by improving her oration. Not quite knowing what she is getting herself into, Eliza accepts and moves into Higgins' home, and he initiates round-the-clock training. Eliza's good-for-nothing perpetually unemployed father Alfred (Stanley Holloway) senses an opportunity to make some money off Higgins. Meanwhile, Eliza finally makes a breakthrough in her pronunciation skills and Higgins starts to test her in social circles, including interactions with his mother Mrs. Higgins (Gladys Cooper) and a young potential beau Freddy (Jeremy Brett). Eliza starts to develop feelings for Higgins despite all his faults, but his supreme arrogance gets in the way. An adaptation of the Pygmalion-inspired stage musical conceived by lyricist Alan Jay Lerner and composer Frederick Loewe, the film version of My Fair Lady succeeds in translating the show onto film with a rich aura of grandeur. Extravagantly directed by George Cukor, the film features magnanimous sets and splendid costumes to go along with George Bernard Shaw's acerbic commentary on England's classism. The highlights are many, built around some of the best and most famous songs to make it into a film musical. As is commonly the case in musicals the first part is by far the stronger, and Cukor hits a stunning purple patch including Eliza dreaming about a better life in Wouldn't It Be Loverly, Alfred espousing the skills of doing nothing in With A Little Bit Of Luck, and then reaching a climax with the stunning double back-to back peaks of The Rain In Spain and I Could Have Danced All Night. The most biting sequence in terms of sharp wit occurs during Eliza's first planned sojourn into the world of the wealthy at the Ascot races. 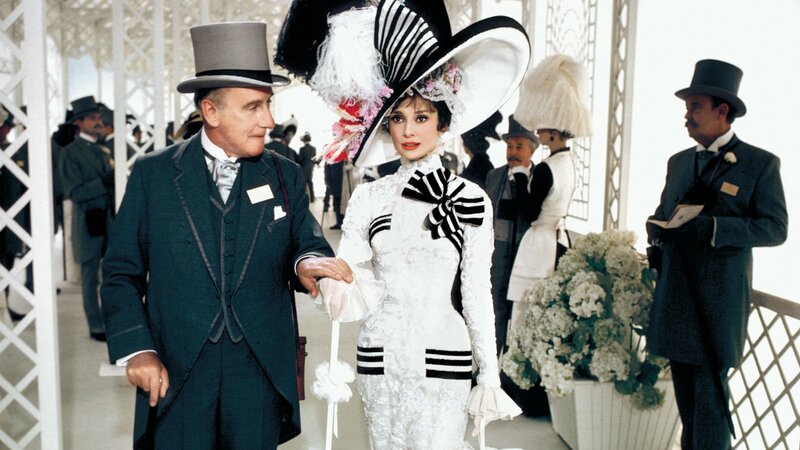 Cukor stages the Ascot Gavotte with delightful discipline, laying bare the habits of the affluent yet ridiculous class, where every movement is measured and critiqued but nevertheless absurd. Eliza will never fit in with these people, and nor would she want to. After the intermission, the songs take a break and visual splendor takes over, as Cukor unspools an effusive embassy ball scene, a standard-setting affair with sparkling costumes and matching behaviour in ballrooms and hallways filled with highbrow diplomats, royalty, military types, intelligentsia and glitterati. With a mammoth running time of 170 minutes, the film of course has its faults. Higgins gets too many similar songs. Why Can't The English Learn To Speak, An Ordinary Man, You Did It, and Why Can't A Woman Be More Like A Man are all fine but also all too similar, hammering away at overlapping narcissism themes and pushing Higgins' characters towards an almost unsalvageable corner. The second half does inevitably sag, although it would have been miraculous had the momentum of the sterling opening 100 minutes been sustained. Despite having her singing dubbed by Marni Nixon, Audrey Hepburn sparkles with wit and honesty, and carries the Cecil Beaton designed costumes with remarkable grace. Whether as a Covent Garden flower girl or as a tentative debutant on the elite social scene, the role of Eliza is a prominent jewel in Hepburn's extraordinary career crown. 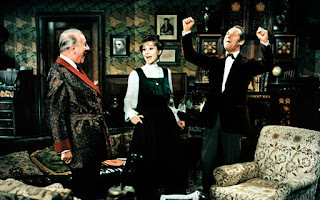 Rex Harrison matches her with a performance full of self-satisfied bombast. My Fair Lady is traditional Hollywood at its finest, putting on a no-expenses-spared show with the stars shining bright. Yeah, I really like this one. The fact that I have a degree in linguistics certainly biases me, though, so I'm not an entirely impartial observer. My chosen field doesn't get a lot of play in movies, and very rarely in musicals. I love this too. I used to watch this all the time as a child, then didn't watch it for a few years. Then I re-watched it as an adult, and my goodness, the jokes and references to what Alfred suspects Higgins wants to do with his daughter had gone right over my head as a child!